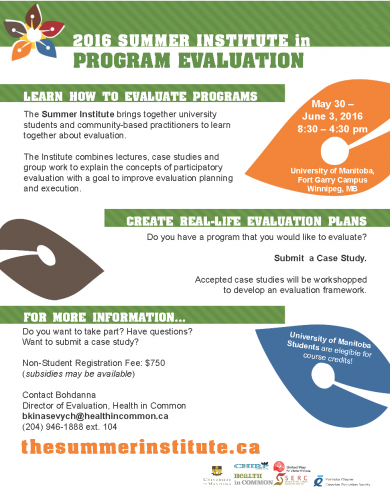 The Summer Institute brings together university students and community-based practicioners to learn together about evaluation. The Institute combines lectures, case studies and group work to explain the concepts of participatory evaluation with a goal to improve evaluation planning and execution. Do you have a program that you would like to evaluate? Accepted case studies will be workshopped to develop an evaluation framework. University of Manitoba Students are eligible for course credits! Do you want to take part? Have questions? Want to submit a case study?